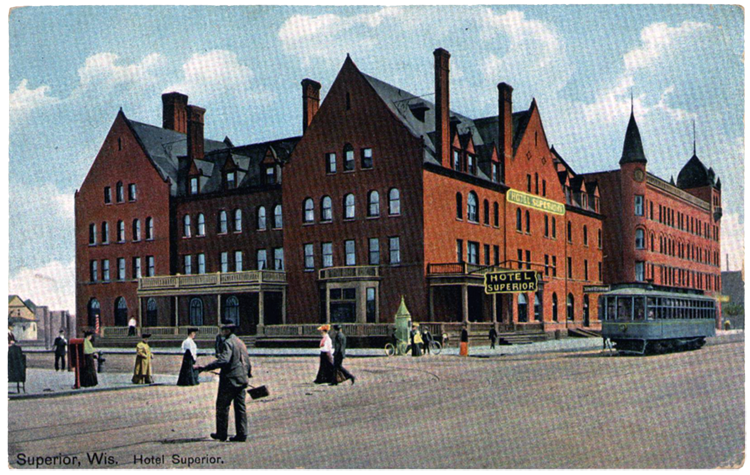 Built by Robert Belknap’s Land and River Improvement Company, the Superior Hotel was outfitted with every luxury available in its day. The hotel played host to a variety of events, from lectures to dances; a dance club named the “8 to 12 Club” called the hotel home during the 1890s, and William Jennings Bryan spoke from its steps during his presidential campaigns. A fire in 1940 destroyed the hotel’s north wing, and that portion of the hotel was never rebuilt. The hotel closed in the late 1960s and was later razed. The Superior Public Library now stands in its place. An urban legend once claimed that the hotel included a two-hundred-foot tunnel to the Grand Opera House, but the truth is the two building shared a common heating plant, and its pipes ran beneath Belknap Street.